This policy applies to all employees, students, and visitors using Richland Campus parking areas. The purpose of this policy is to establish parking guidelines as well as a process for enforcement, payment, and appeal. This policy will supersede any existing parking policies. The College assumes no responsibility for security of vehicles or their contents, while moving or parked in the Richland Campus parking areas. All employees, students, and visitors use parking facilities at their own risk. Vehicles parked in prohibited parking areas will be ticketed and/or towed. “Reserved Parking” spaces are in effect seven days per week, 24 hours a day. No person shall park a vehicle attended or unattended overnight without permission from the Office of Security and Safety. 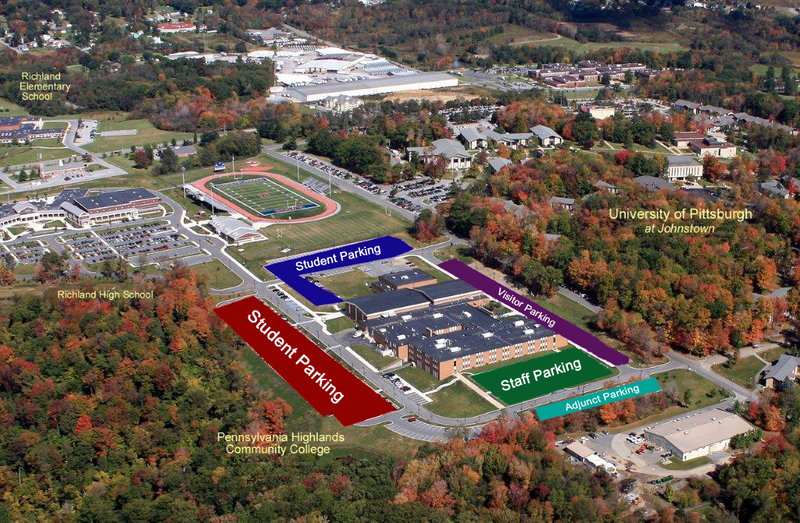 All Pennsylvania Highlands Community College parking tickets issued shall be paid at the Bursar’s Office located at the Richland Campus within fourteen (14) days of issue date. Tickets not paid within the fourteen (14) days will increase by $5.00. Failure to pay a fine or report to the Office of Security and Safety will result in a hold being placed on student transcripts. Violations of disabled/handicapped parking will result in a fine of $50.00 and the vehicle may be towed at the owner’s expense for any disabled/handicapped violation. All other parking violations will result in a $15 fine. Requests for review of a parking ticket must be made in writing or email to the Director of Security and Safety (security@pennhighlands.edu) within 5 days of receiving the parking ticket. When a parking ticket is appealed, payment must be made at time of appeal to the Bursar’s Office. The Vice President of Finance and Administration will review the ticket and will make a decision as to the outcome of the review. If a ticket is dismissed, a refund payment will be made through the Bursar’s Office to the person making the appeal. All full time and part time employees working at the Richland Campus will be issued a parking permit for the Richland Campus. The parking permit must be displayed in the employee’s vehicle when parked in the Staff parking Lot or in a designated reserved parking space. All Adjunct Instructors will be issued a temporary Adjunct Parking Permit. The Adjunct Parking Permit shall be displayed whenever parking in the designated Adjunct parking lot. The Adjunct Parking Permit shall not be used to park in the Staff parking lot between 7:00 AM and 4:00 PM. Adjuncts may use the Staff parking lot after 4pm. Employees who misplace their issued parking permit will be assessed a $5 replacement fee.